This is something I have never seen before. 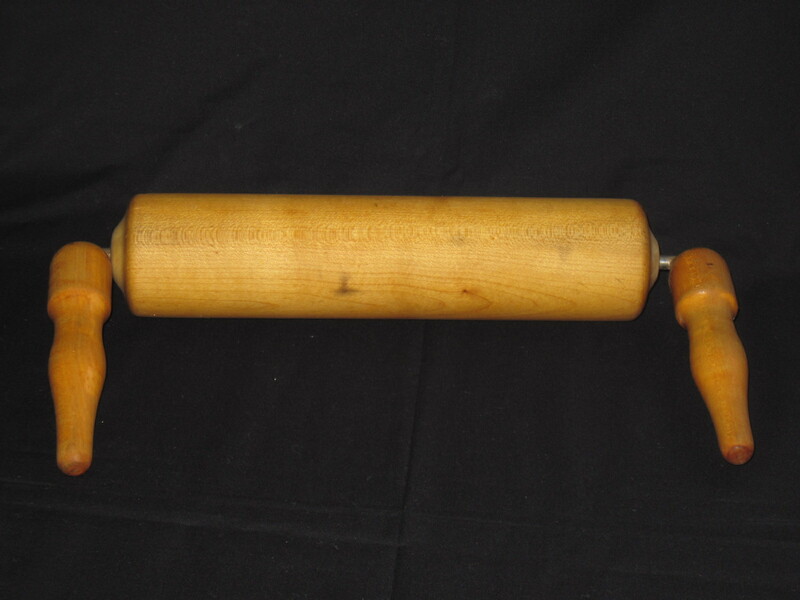 The handles of the rolling pin are at right angles to the pin. I suppose it would make it much easier to roll your dough out with this if you have limited counter space. I haven’t used it so I don’t know how it would feel to use. Might be quite nifty to try. If anyone out there has seen this type of rolling pin before or has one, I would be interested in knowing how they like using it. I really don’t have a price on this yet, as it may turn out to be worth a bit more than the standard ones. Certainly has novelty value anyway. Update: There are some letters on the side of the rolling pin, D.R.G.M. The letters stand for Deutsches Reichsgebrauchsmuster which simply means officially registered in Germany and dates from 1892 to 1952 when the mark was used. There is no way to tell who made it though. This salad bowl set was made by Baribeau & Fils Inc in Montreal Quebec in the 1960’s under the trademark Baribocraft. Baribocraft was made for the retail market and their other trademark Baribo-Maid was made for the wholesale market. Baribeau ceased production in the 1970’s. 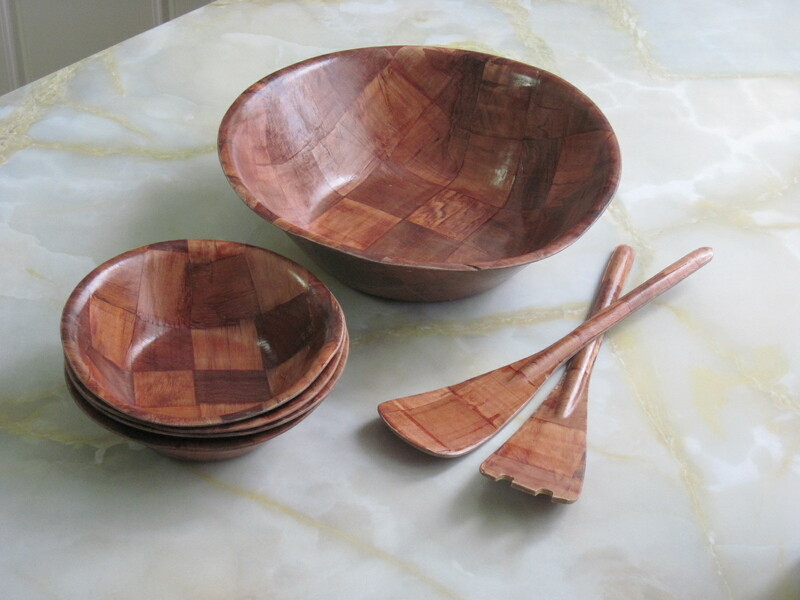 They used Canadian maple wood and skilled Canadian artisans to produce lasting and beautiful woodenware. 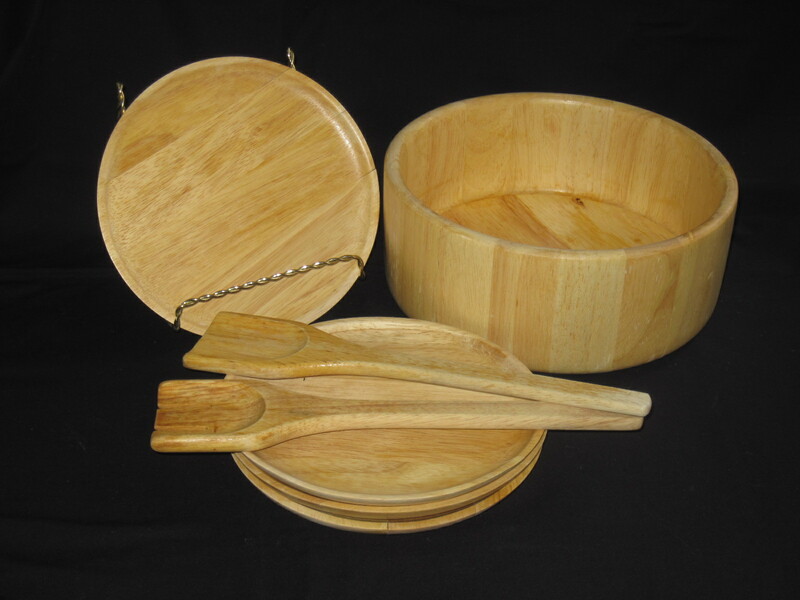 The result is high quality woodenware items that are still sought after today. During the 1950’s and 1960’s the Danish modern teak look was very popular so Baribocraft stained some of the their maple wood bowls teak in order compete in that market. 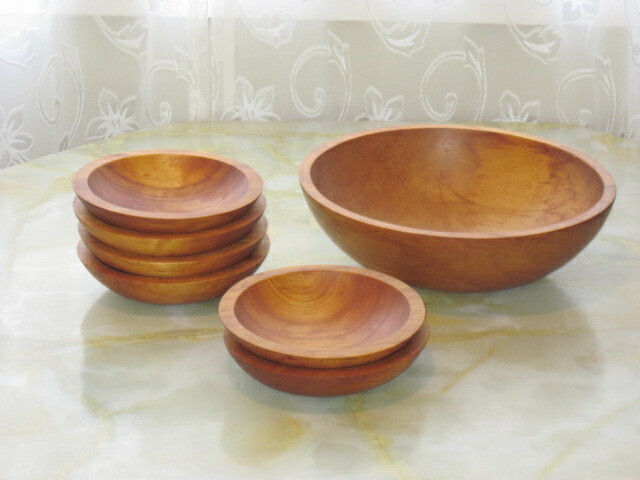 Some of their bowls were left in the natural lighter maple wood colour like the set above. These bowls have been lightly cleaned and sanded and then hand rubbed with a foodsafe beeswax wood finish which brings out the natural colour and highlights of the wood. Truly beautiful woodenware. Large Salad bowl and 4 smaller salad bowls with servers, probably made of Tsubaki wood. Dishwasher safe and does not absorb odours. Bowls are in good condition showing little signs of usage. Unknown manufacturer. Probably date from the mid to late 1970’s. I do remember having a set like this around that time frame. To see this and many other mid century kitchen items, please visit me at my booth at the Almonte Antique Market, 26 Mill Street, Almonte ON, just 30 minutes west of the city of Ottawa ON. Open 7 days a week, all year long, from 10am to 5pm. Plenty of free parking at rear of the building. Over 50 vendors in a heritage 2 storey brick building selling a wide range of antiques and collectibles. I will also have a booth at the Ottawa Antique & Vintage Market being held on March 21st and 22nd 2015, at the Carleton University Fieldhouse Building. Salad set consisting of large salad bowl, 4 salad plates and set of servers. Still has the original stickers on the bottoms of the pieces saying made in Thailand. Most likely made of Beechwood. In very good condition with little signs of wear. Set is priced at $35.